Not only that, but DigiPen students have won awards for many of these video game projects (the game that inspired Portal was created at DigiPen). So, you have to be ready to work hard. But, if you don’t mind serious student debt, the program can give you what you’re looking for in terms of computer science and game design skills, and a great professional network. Let’s take a closer look at your options, and what makes the DigiPen institute worthwhile. At DigiPen, you’ll choose between a Bachelor of Arts in Game Design, or a Bachelor of Science in Computer Science, with some flexibility in your focus—either Real-Time Interactive Simulation, or Game Design. Let’s start with the BA in Game Design. Working in teams, communicating, collaborating—you won’t be able to build games without these skills. A school program that conditions you for work in a team environment will be advantageous down the line. But it’s not without its pitfalls—when it comes to your portfolio, for example. If you’ve collaborated with a team to design games in your portfolio, make sure you can clearly articulate your role in that game. Make sure hiring managers know exactly which elements of the game you were responsible for. Otherwise, they could take that particular submission with a grain of salt. And there’s merit there. Narrative, audio, psychology—these are lesser-tended facets of game design. It’s easy to remember the code, or the character design, or the level design elements of a game, because those are obvious. But narrative and audio can go a long way in changing the caliber of projects you make. And psychology—if you learn what makes people tick, and what human tendencies are, you can find ways to give them what they want, or surprise them with something new. 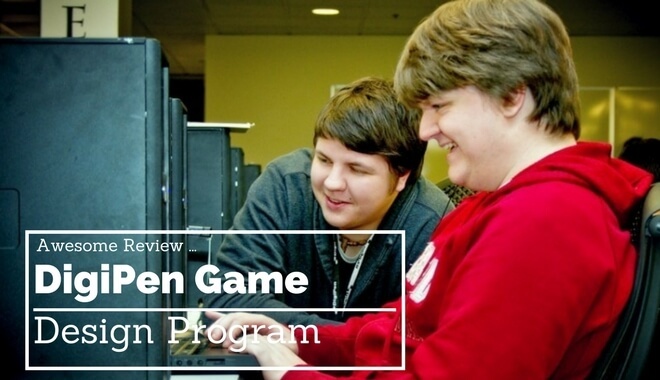 This curriculum touches on what we mentioned earlier—the “hidden” layers of game design. These foundational topics can give you an outlet to pursue more nuanced aspects of game design—or give you an edge over the competition. These skills have an everyday, practical application, but who knows what clever idea you could pull into your games from these disciplines. If you like programming, and you’re interested in game design, it’s hard to go wrong with a computer science degree. Before game design degrees, there were only computer science degrees. CS degrees were the go-to move for many aspiring game creators. The CS background is still highly valuable. It’s versatile—if somewhere down the road you fall out of love with designing video games, there’s plenty of demand in other industries for quality programmers. DigiPen says “the field of digital entertainment has grown from using small teams of just a handful of developers for an entire game to using large teams of one hundred or more on a single title. This program also includes Humanities and social sciences, which includes psychology, writing, etc. (again, similar to the BA course listings). With this degree, you could do everything from Game design, to technical design, to tools programmer. The Bachelor of Science in Computer Science in Real-Time Interactive Simulation offers a unique opportunity for students—the chance to get their Master of Science in CS, in conjunction with their BS, through an accelerated schedule at DigiPen. And that’s the tip of the iceberg. Computer networks, graphical user interfaces, and game production are also covered in the program. With this degree, you could be a Gameplay Programmer, a Software Architect, an Artificial Intelligence Programmer, along with other careers. Now that you know what you’d be getting into…we should take a quick look at how to get in. But, depending on your major, you’ll need to submit some extra elements. For the BA in Game Design, you’ll need to submit a design portfolio. Computer Science applicants will likely have to submit mathematics and science requirements. The application requirements aren’t too crazy, as you can see. But it does require that you’ve demonstrated some of your own initiatives with game design (in the case of the BA), or some proficiency with maths and sciences (for the BS in CS degrees). Dudeman21, a programmer on Reddit who works for Nintendo, left a comment on Reddit that might be good to hear (especially if you like Nintendo). That whole Reddit thread is worth a look. There are arguments for and against going to DigiPen. Even on the negative reviews, most commenters agreed that DigiPen is a great place to network and gain connections. So, if you do decide to go to DigiPen…Get ready to connect with people!